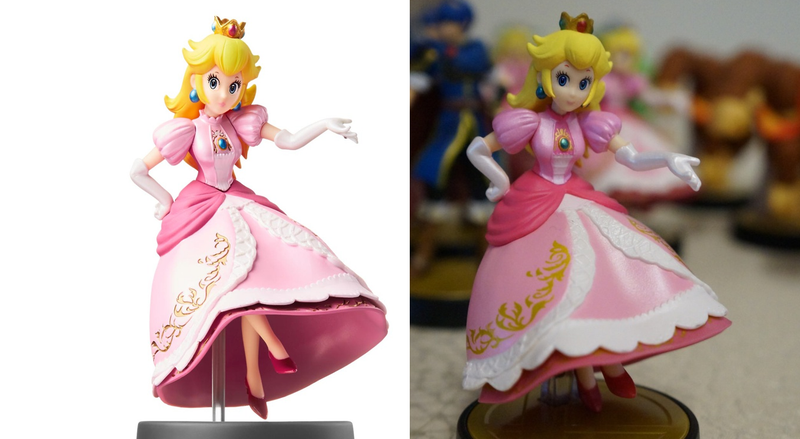 When introduced at E3 earlier this year and in the marketing materials that followed, Nintendo's little plastic figures looked fantastic, but some of the finer details seem to have been lost to the production process. Joystiq posted a set of photos featuring the finished figures earlier this week, which have been making the Reddit rounds over the weekend. Some think they look fine for $13 figures with tech embedded inside them. I think they look fine for what they are. It's just what they are isn't quite what we've been seeing at retailers for preorder — they've been using the prototype pictures. Take Princess Peach, for instance. The brocade pattern on her dress looked inlaid in the original shot. Now it's just paint. The fine detail around her pendant has changed colors, the hands seem a little chunkier, and overall the plastic looks like its of much lower quality. The thin, translucent plastic pole that held aloft the hero of Hyrule is now this strange amber thing, as if he were borne aloft on a column of urine. The thicker post makes sense. The flimsy thing in the original pictures wouldn't have held up to rigorous play. Perhaps that's why the Wii Fit Trainer now has a foot cast. Similarly, the sad shape of Marth's sword could probably be explained by softer plastic having to be used for a sharp object aimed at children. Or maybe he's just not feeling it today. I still say the figures look fine, and plan on breaking myself buying each of the initial batch of 18 figures. I'm one of the toy guys here, I pretty much have to — but I would anyway. I just hope my Kirby doesn't wind up with subtly off-center eyes. That would drive me nuts. This is pretty much how all action figures work. A prototype is made, some high-quality samples are produced, and then they are sent off to be mass-produced, a process that often isn't up to reproducing the exact look of those early gems. Besides, those little flaws won't matter much at all once your Amiibo is packing a level 50 Super Smash Bros. fighter you've raised from a pup. Check out more images of the figures at the link below.